Our most cost effective solution with a PLC and two line display. Analog devices and advanced control without many unrelated controllers. Designs ranging from 50 to 5000 GPD. Available with 230V or 460V 3 phase pump. A Conductivity probe on the permeate comes standard. 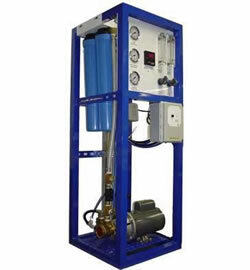 Able to function with a large variety of source and destination tank or plumbing configurations. Stainless steel welded frame standard.